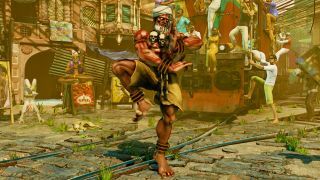 Capcom announced today that Street Fighter 5 will be out on February 16, 2016, and that the Indian Yogi Dhalsim will be part of the initial cast. It also revealed plans to release six more characters following the game's launch at a hoped-for rate of one every two months, bringing the total number of fighters in the lineup to 22 by the beginning of 2016. "In case you haven’t heard, Street Fighter V is moving away from doing large bundles of post launch content, such as our prior Super or Ultra upgrades, and instead will be continuously releasing new post launch content on a regular basis," Capcom wrote on its blog. "No longer will you need to wait one or two years for new Street Fighter goodness; it will always be right around the corner." That content will be purchasable with "Fight Money," an in-game currency used to "reward players who stay engaged with Street Fighter V over time." Pricing and accumulation rates haven't been nailed down yet, but Capcom said there will be two primary methods for earning it: Through daily goals, like landing a specific number of anti-air attacks or Hadoukens, and by leveling characters through different game modes. "To remove any confusion up front, leveling up a character in Street Fighter V will not affect game balance. It only shows how much time and effort an individual has placed into learning a character," Capcom explained. "Each time a player levels up a character, they will receive a Fight Money bonus. Earlier levels will be easy to obtain, and will scale to become more difficult the higher the level." And of course, for players who don't want to wait, all post-launch content can also be acquired instantly with "Zenny," a "premium currency" that can be purchased with real money. As for Dhalsim, he's picked up a few new tricks that will prove handy in combat, including Yoga Float, during which he floats in the air and can access all airborne attacks and specials, and Yoga Burner, a stream of flames that will remain on the ground "for an extended period of time" and drain the life of enemy fighters who stand in it.